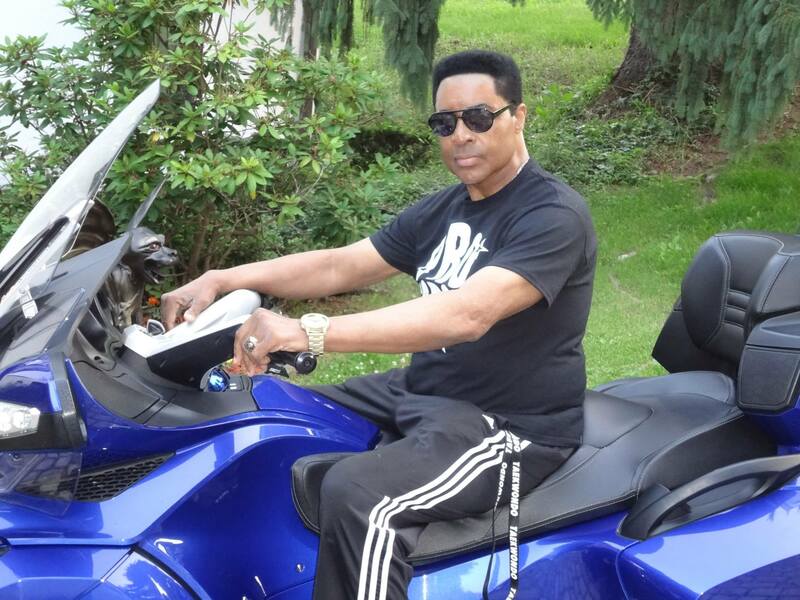 Jacquet Bazemore, 65, of Highland Park passed away this morning after a long bout with kidney disease. Sunrise: May 27, 1950. Sunset February 14, 2016 (Valentines Day). In the wake of former UFC champion Kevin Randleman’s unexpected death, the MMA world mourns once again with the passing of another pioneer; Jacquet Honore Travair Trasone Leslie Bazemore. 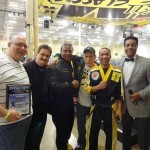 The two-tour Vietnam vet, Pastor, and mixed martial artist legend has a story that most MMA fans haven’t heard. 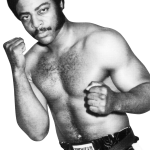 In the 1970s, Pittsburgh was a hotbed for mixed martial arts competition including one of the most prolific fighters of the time, the legendary Jacquet Bazemore. 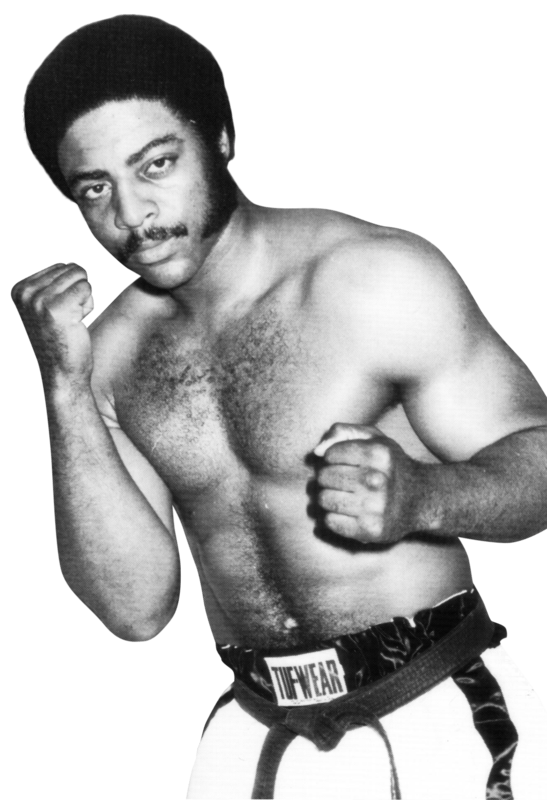 He was a World Heavyweight Kickboxing Champion, the nephew of boxing legend Archie Moore and a sparring partner for Muhammad Ali. At 6-foot-4, 230 pounds, the former marine towered over most, and took no backtalk. He grew up in the hard streets of Pittsburgh long before the Octagon was in vogue or Royce Gracie made his pay-per-view debut; decades before the UFC became a household brand and while the likes of Dana White were still in elementary school. 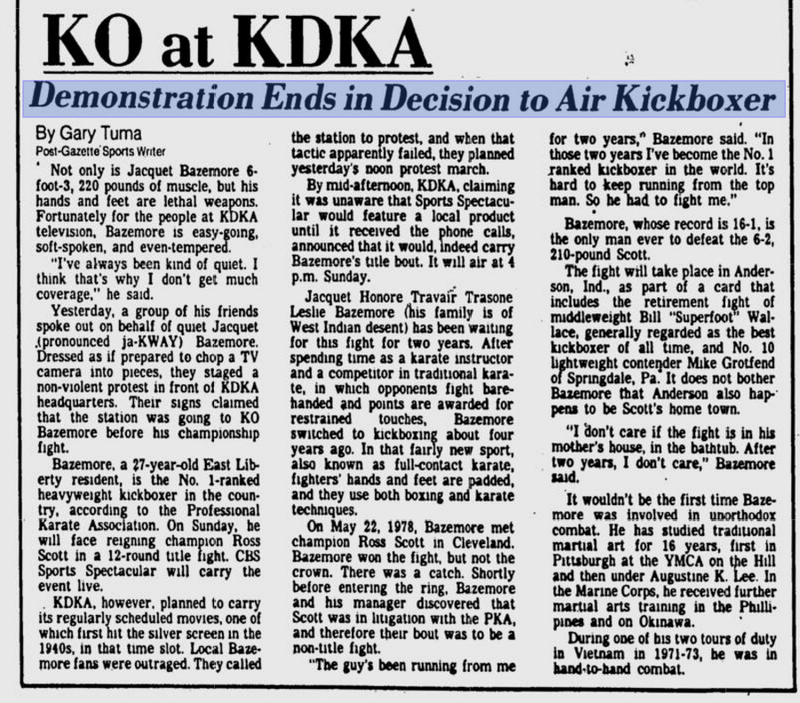 Pittsburgh’s own Bazemore was on the cusp of the first mixed martial arts revolution. 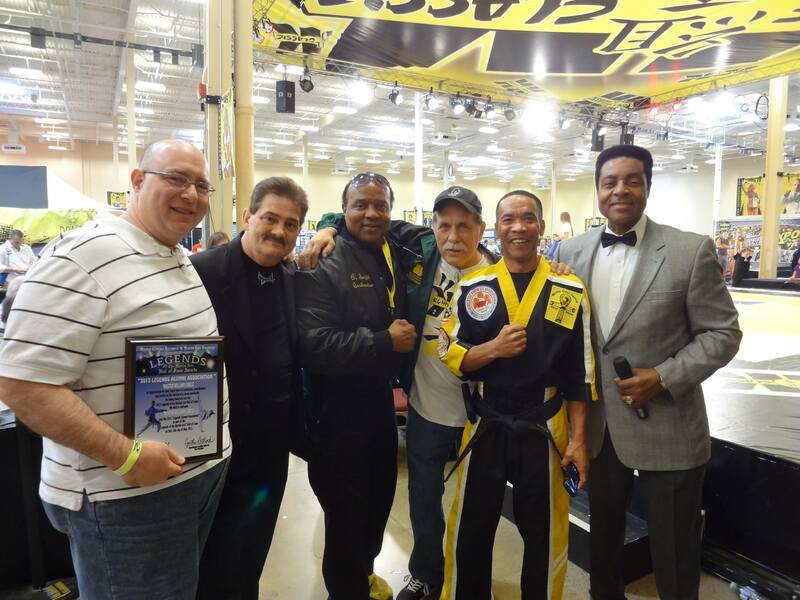 In 1979, CV (Caliguri & Viola) Productions Inc. became the first mixed martial arts company in the United States and enlisted Jacquet Bazmore as the man in the middle—The Ref. At the time he was the #1 ranked PKA Heavyweight Kickboxer in the world. Bazemore was the perfect choice to police the first regulated MMA competitions in America. Simply put, he was the Big John McCarthy of a forgotten era. 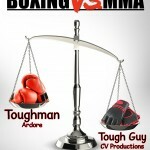 That “Tough Guy” era was born in Pittsburgh, Pennsylvania; the Cooperstown of MMA. Bazemore, one in a long list of trailblazers who have passed on, growing old, or fading away into obscurity, is part of a sad trend. Fighters like Dave Jones, who suffers from a chronic blood disorder (Porphyria cutanea tarda) and his opponent Mike Murray (cancer) fight for their lives today, but in 1980 they stood opposite Jacquet in the red and blue corners. They made history and deserve respect. As I write this piece, I am reminded of how precious our time is with them, and how often we take for granted the road they paved. I know my voice is loud in Pittsburgh, but I don’t have the volume of the UFC to reach the world. Does the UFC owe the likes of Jacquet Bazemore “ANYTHING”? Probably Not. But they should however be thankful for “EVERYTHING.” You see, everyone from Art Davie to Dana White and all in between can thank the Pennsylvania state legislature for banning MMA in 1983 (Tough Guy Law), because without them, the UFC as we know it would have never existed! I doubt Dana White is losing any sleep over the Godfathers of MMA; afterall he was able to cash in on a diamond in the rough. He didn’t steal the gem; he just polished it and did a damn good job. 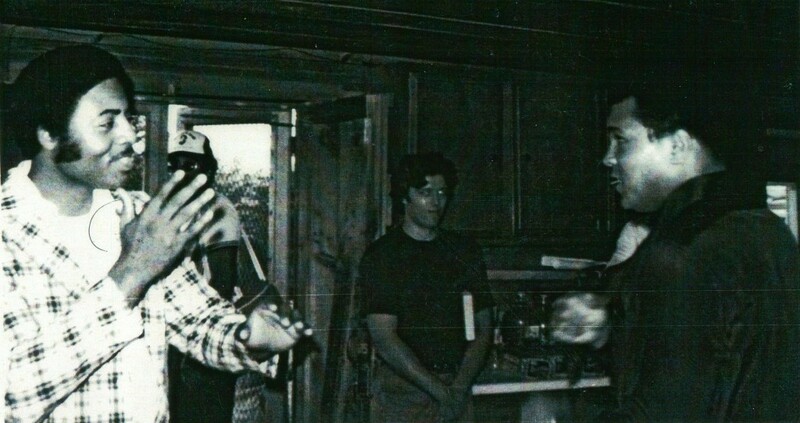 Just don’t forget that treasure passed through many hands: CV Productions (1979) to WOW Promotions (1993) to SEG Entertainment (1995) to Zuffa (2001-present). If MMA wants to be considered the crown jewel, then the UFC should treat MMA’s history as a priceless commodity; handle it with the same reverence as boxing, baseball and all the other great American institutions. Major League Baseball has erred historically and amended their books to give credit where credit is due. I hope the UFC will do the same. They certainly aren’t obligated to, MMA is a free market, but they are the 800-pound gorilla and the world is watching. The UFC can’t be expected to honor rivals, but forefathers like Bazemore pre-date their existence. 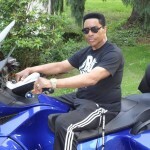 Now is an opportunity to do the right thing and say yeah, those guys really were pioneers. While Royce Gracie will always be remembered as the Babe Ruth of MMA, a group of men like Bazmore “existed” and played before those stars were born. They also deserve a permanent place in the annals of history. It’s not too late to give the sport due diligence. 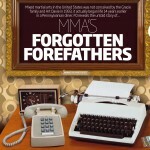 The MMA community should embrace the past as it won’t tarnish the future. I’m not even sure if Dana and company are even privy to the full story; much of the sport’s early history has been buried. White and the Fertitta brothers are the reason MMA is successful today, but like Thomas Edison’s claim to fame, they didn’t invent the light bulb; they just knew how to sell it. As the UFC prepares to visit the Steel City next week (2/21/16) for Fight Night 83: Cowboy vs Cowboy, I urge Zuffa’s top brass to reminisce and recognize the significance of this region. On behalf of the entire Pittsburgh MMA community, we ask that you honor Jaquet Bazemore with a “Ten-Bell Salute” at the fight. After all, this was his city; the birthplace of MMA. RIP CHAMP. 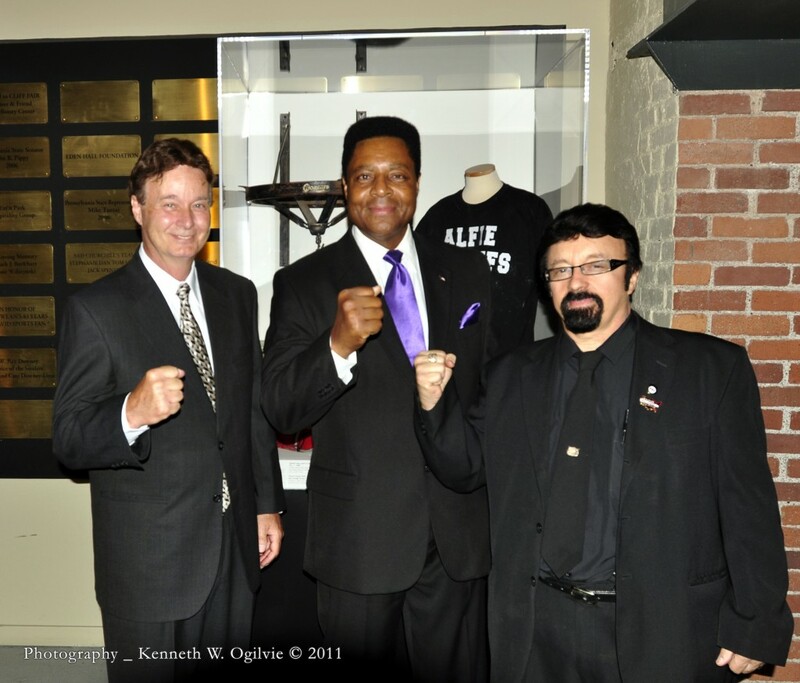 In 2010 Bazemore was honored at the Western PA Sports Museum for his role as mixed martial arts referee. 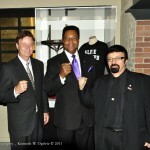 -(left to right) Bill Viola, Jacquet Bazemore, Frank Caliguri. Bazemore was honored at the Western PA Sports Museum as part of an exhibit recognizing Pittsburgh as the birthplace of MMA. 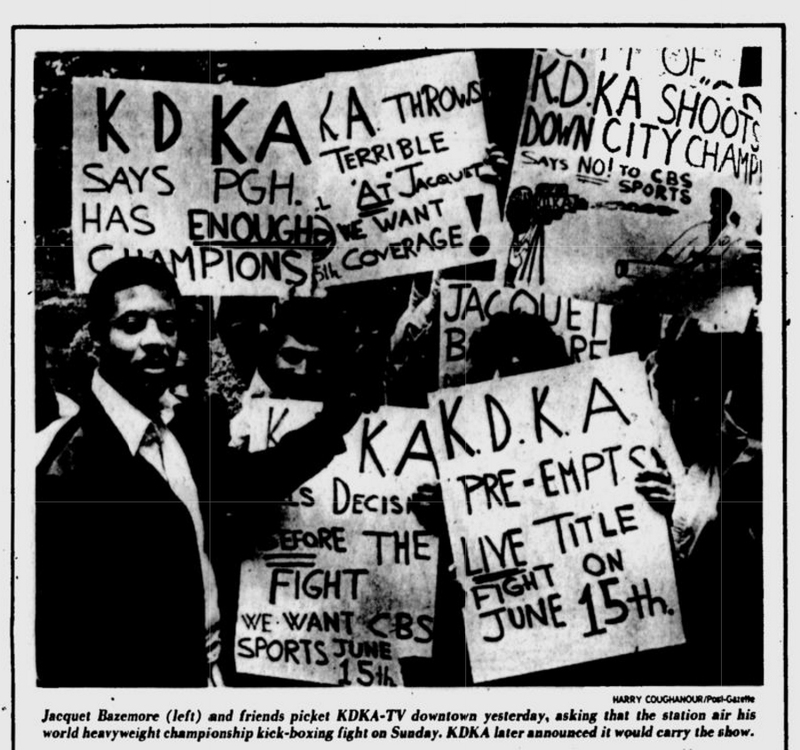 KO at KDKA Thursday, June 12, 1980. Pittsburgh Post-Gazette. 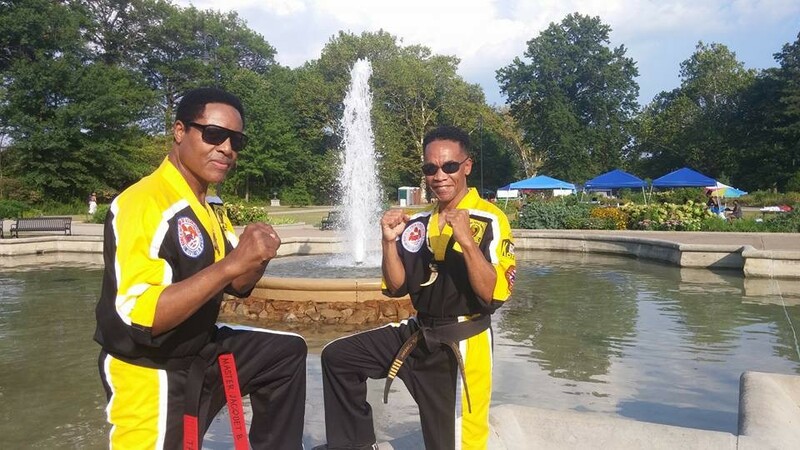 On the day of his passing (2/14/16) Grand Master Jacquet Bazemore was featured in the Pittsburgh Post-Gazette doing what he loved, teaching martial arts. 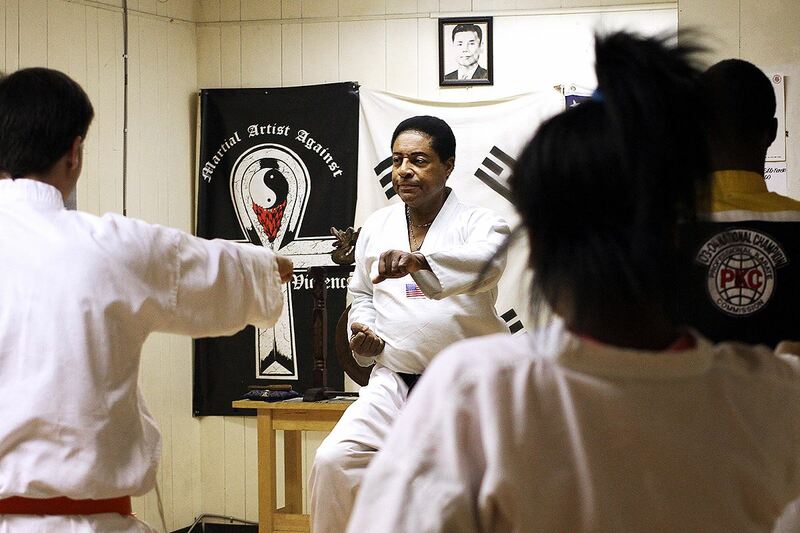 Grand Master Jacquet Bazemore leads a class at Martial Artists Against Street Violence on Frankstown Avenue in Pittsburgh. 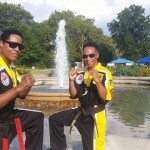 The academy aims to teach martial arts as an alternative to violence in the community.